This elusive concept haunts the periphery of three distinct artists’ works, and for the month of April, Projects Gallery (which also sells my work) has three simultaneous solo shows of disparate artists who are united under the umbrella concept of Perception : Reality. Canadian Ross Bonfanti creates his popular "concreatures" (if you've ever been to an art fair anywhere, any art fair... you've seen them) by rescuing cute, stuffed animals from thrift stores and ripping the stuffing out of ‘em. The empty vessels are then filled with concrete. Once cured, the fur skin is peeled away, leaving a disarming "concreature" in place. 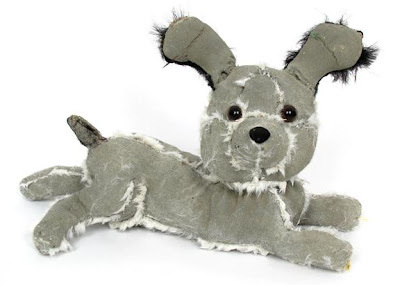 Textured with the underside of the fabric, with fur embedded in the exposed seams, these sculptures retain their plush appearance and original features, including button eyes and noses. The resulting sculpture is a constant juxtaposition between the expected and the actual. Philadelphian Lauren Lyons is widely regarded for her photography of bands in highly stylized shoots. She has photographed artist portraits and cheeky scenarios for illustrious clients such as Interscope Records, PETA, HBO, and Philadelphia Magazine. Celebrated for her accentuation of the artifice of her subjects, Lyons’ work exemplifies a contraction; she captures the visual evidence of the veneer. Her carefully constructed images provide elusive glimpses at the truth, enough to ‘whet the palette’, ultimately creating a composed stylized truth. Fellow Cuban Alex Queral’s carved phonebooks usually receive the “how’d-he-do-that?” attention wherever they are exhibited. 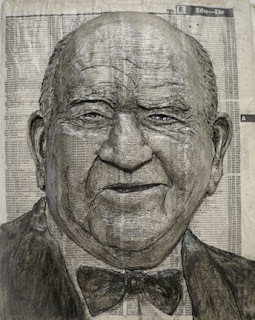 His lushly detailed carvings are created from the soft material of phonebooks. Using classical carving techniques on an unexpected material, Queral brings forth the individual from the faceless masses. Queral crafts recognizable visages, vaguely familiar but elusively foreign, as well as evoking his own cast of characters from the bound sheets of paper. Projects Gallery presents these three divergent artists from different regions of the continent. Each will be given their own exhibition space to focus on the individual artist, but the thematic thread connects them all. Popular in their own right, Perception : Reality invites the viewer to discover what lays beyond the first impression of these three artists’ works. Perception : Reality will be on display April 6 - 25, 2009. There will also be an artist reception on First Friday, April 6th from 6 - 9 p.m. The reception is free and open to the public. Projects Gallery is located at 629 N. 2nd St. in Philadelphia’s Northern Liberties section. Wanna go to an opening in Frederick, MD this weekend? The Delaplaine Visual Arts Education Center has an openning reception, on Saturday, April 4, 2008, 3-5 pm for married artists William “Skip” Lawrence and Diane Santarella, who have simultaneous shows in April, at the Delaplaine Visual Arts Education Center Center in Frederick, Maryland. Large canvases with rich layers of color will fill the Delaplaine’s F&M Gallery in “Homecoming”, recent paintings by William “Skip” Lawrence. "States of Mind" , by Diane Santarella, is showing in the Delaplaine’s Gardiner Gallery. Santarella’s paintings explore the graphic, visual experience of meditation, migraines, dreamscapes, and the organization of mental minutiae. In Washington, DC, Conner Contemporary celebrates their first decade with concurrent solo exhibitions of new work by three gallery artists: Erik Thor Sandberg, Dean Kessmann and Isaac Maiselman. 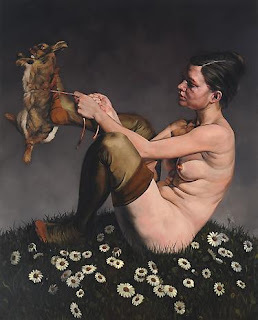 I consider Erik Thor Sandberg to be one of the best painters that I have ever met. His natural skills and his work ethic combine to deliver an artist who is somewhat of a throwback to the great age of painting, but also an artist whose consummate skill is also married to a very contemporary dialogue. Conner describes Sandberg as an artist who "calls forth the regenerative powers of nature in Cyclical Nature, his third solo exhibition with the Gallery. Viewing the artist's latest series of large oil paintings on canvas elicits as much pleasure as he evidently took in painting them. Freeing figures from interior settings of his previous compositions, Sandberg opened magnificent landscape vistas as sites for the enactment of life, death and regeneration. In his inventive allegories, people and animals negotiate a tenuous balance between knowledge and irrationality. Sandberg reconciled the unsettling eventualities of his protagonists' actions by grounding them in vital elements which assert nature's boundless forces of reclamation and rebirth." Dean Kessmann furthers his exploration of unusual ways of seeing familiar architectural spaces in Architectural Intersections, his third solo exhibition with the Gallery. In his first solo exhibition with Conner, artist Isaac Maiselman critiques political exploitation of religion in the video installation Entre el Dios, El Diablo. The openings are on Saturday, April 4 from 6-8PM. If you are a lover of great painting, do not miss this show. Kris Wilton reports in artinfo.com.